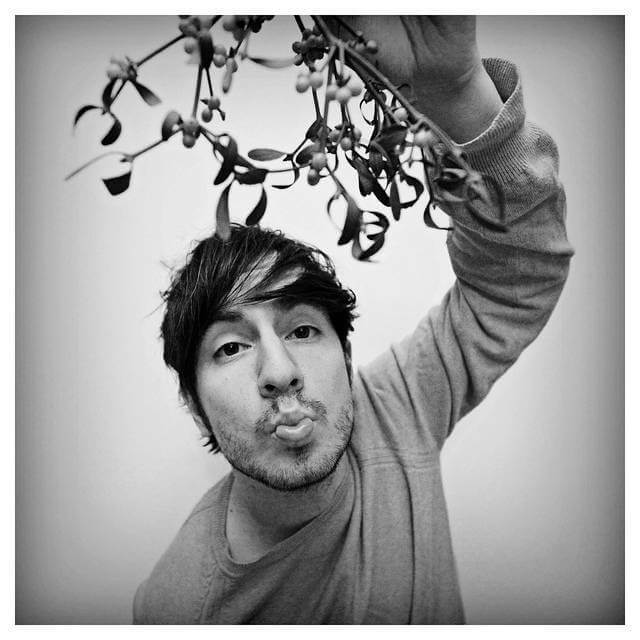 Many of us have done it at one time or another: kissed someone under the mistletoe. Whether at a holiday party with a complete stranger or at home with a spouse, kissing under the leaves and berries of this partially parasitic plant is an ancient custom. Have you ever stopped to wonder how this odd practice got started? Actually, there is quite a bit of fascinating history behind this time-honored tradition. No one is exactly sure which myth led to the practice of hanging the mistletoe, but there are plenty to choose from. Here are some of the most popular legends. At this year’s Christmas party, all attention will be on you as you share the stories behind the mistletoe. Even without all of the myths and stories surrounding it, mistletoe is fascinating. This is because it seems to grow out of nowhere in a big ball in tree branches, and it is evergreen. These characteristics are likely what made it seem magical to our early ancestors. Mistletoe is partially parasitic. It attaches to a host tree by modified roots called haustoria, which penetrate the tree and take up water and nutrients from it. Mistletoe can weaken and even kill trees, but on the other hand, the berries are an important shelter and food source for birds. In fact, you could say birds and mistletoe have a symbiotic relationship; mistletoe berries feed the birds, and the birds digest and disperse the seeds, allowing the plant to spread. In fact, the name mistletoe means “dung-on-twig” in Anglo-Saxon because the mistletoe plant seems to appear when the sticky seeds found in bird feces land on a twig. Although the berries are an important food source for birds, they are poisonous to most mammals, including humans. Conversely, the plant and berries also have had a wide variety of medicinal uses throughout time; currently, it is used to treat circulatory problems and in cancer medications. 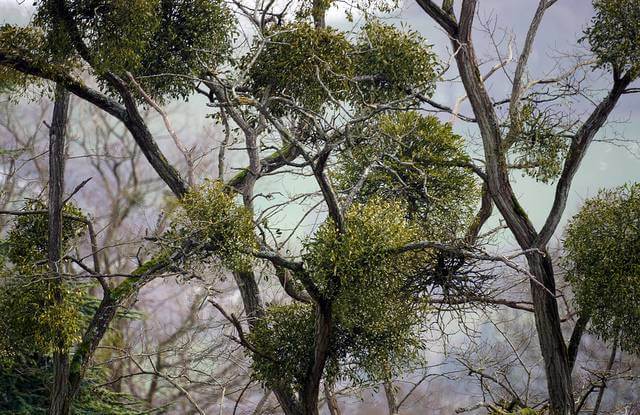 Mistletoe may refer to more than 700 different partially parasitic plants, but the traditional Christmas mistletoe that we see is generally European mistletoe, Viscum album, or North American mistletoe, Phoradendron leucarpum. Mistletoe was prized by the Celtic Druids because it was evergreen and bloomed even during winter. Because of this, the druids saw it as a symbol of life and fertility and used it as an aphrodisiac as well as for other purposes. Mistletoe was cut off of an oak tree in an elaborate Druid ritual during the summer and winter solstices and was hung over doors, as the plant was also said to protect against lightning and other evils. Whenever enemies met in a forest under mistletoe, they were supposed to disarm and make peace the next day. So hanging mistletoe in the doorway was a pagan tradition predating Christianity that could have been passed down through the centuries. It had various meanings related to sexuality, peace, protection, and friendship. In Greece, it was used in marriage ceremonies and at Saturnalia. In Norse mythology, mistletoe was the sacred plant of the goddess of love, Frigga. She was the mother of Balder, the sun god. Balder had an intense dream that he died; this scared Frigga because without the sun, of course, all life would end. So she went all over the world asking plants and animals to promise they would not hurt Balder; however, Frigga forgot about mistletoe. Loki, god of evil and chaos, knew this and killed Balder with an arrow tipped with mistletoe. Frigga supposedly was able to bring Balder back to life. Her tears are said to have turned into the white berries on the plant, and she was so happy she kissed everyone who walked under the mistletoe. She said anyone who walked under it would not come to any harm but instead would receive a kiss. Mistletoe was written about as early as 1500 in Europe. It was said that a fellow should pick a berry every time he kisses a girl under the mistletoe and that when all of the berries were gone, the plant had lost its magical romantic powers. 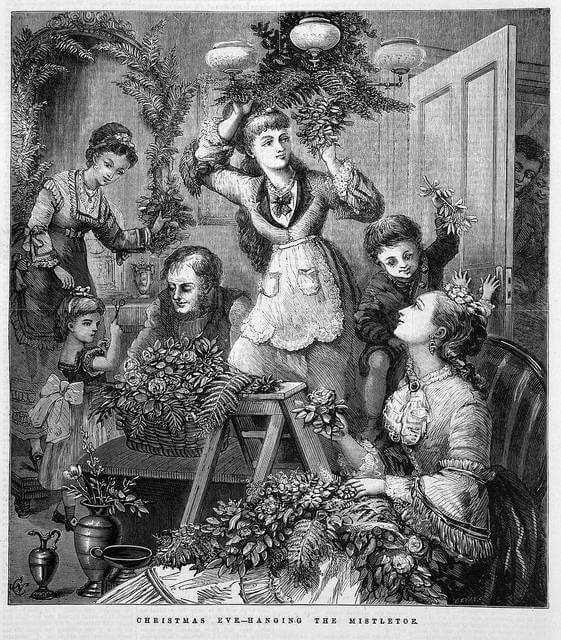 The act of kissing under the mistletoe seems to have started in the lower servant classes first but then spread to the upper classes. By the 18th century, it was common practice at Christmas events. The mistletoe was also called a kissing ball and consisted of greenery, ribbons, and other adornments in addition to mistletoe. It was said that a man could kiss any woman who was standing under the plant and that if a woman refused, it was bad luck; another popular belief was that if a girl stood under the mistletoe and was not kissed, then she would not marry within the year. If a couple kissed under the mistletoe, it was believed they would get married and have a long and happy life together. 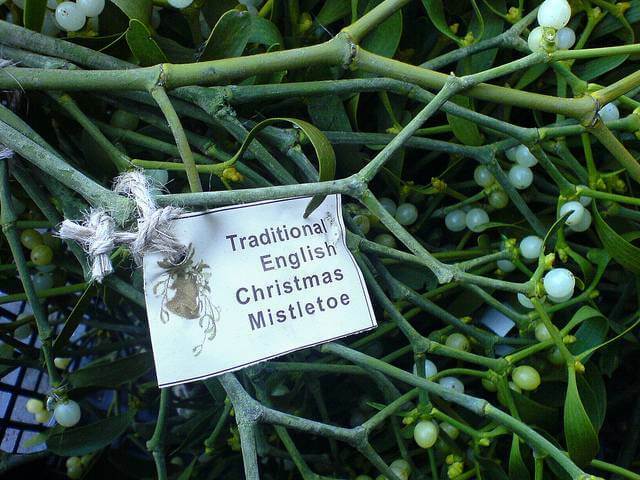 European settlers in North America carried these mistletoe traditions with them when they arrived.